Check www.mta.info for updates, including modified emergency schedules. Sign up for email and text message alerts. Use Metro-North Train Time or the Metro-North Train Time App for real-time train information on your computer or smartphone. Listen to television and radio news. This is the fastest way to find out how train service is affected by the weather. We continuously provide information to the media. Call our Customer Information Center at 511 (in Connecticut call 877-690-5114). The Information Center will have a taped message upfront describing current service conditions. This is an important element in keeping you informed. The volume of calls at the Information Center will increase dramatically during a weather emergency, and you will likely experience delays getting through to a representative. Keep a copy of the current Metro-North timetable. If you cannot access our emergency schedules on the web, it will provide you with a reference point for train departure times from your station if severe weather causes us to alter service. Listen for public address announcements at stations and on board trains if you are already traveling. Always watch your step and watch for icy conditions in station parking lots, and on station sidewalks, stairs, and platforms. Remember: Ice tends to form more quickly on train platforms than on other surfaces. Even if a platform looks clear, it can have icy patches and be slippery..
Use caution driving to and from the station. Infrastructure work on the New Haven Line will mean longer trips for commuters and others — 1 to 6 minutes for peak hours and 1 to 11 minutes for off-peak trips and on weekends, according to Metro-North. 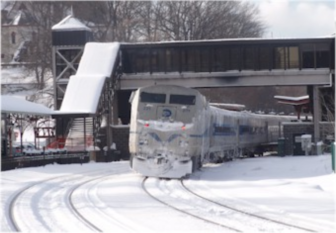 For the New Canaan Branch, trips will be anywhere from 1 to 16 minutes, Metro-North says.